I’m in post production on my new film, HEARTBEATS, a cross cultural dance drama set in India, so I’m listening to a LOT of music for it. Unfortunately I can’t share that music yet as there’s only about 10 people on the planet that have heard it all, but I am SO excited for what we’re creating. However, I do listen to a wise spectrum of music, and always listening to music for inspiration, usually because of a theme or tone I’m exploring in something I’m working on. In no particular order right now, I was just jamming on Galactic’s “Sugar Doosie” from their new album, 4 Non Blondes “What’s Up”, a lot of Prince as of late (I miss that mad genius), I really like Gaslight Anthem’s most recent album “Get Hurt,” especially the title track and “1000 Years”; a super cool dramatic song disguised as a dance tune called “Lost My Way” from Max and another song of his called “Holla”; a great anthem from Johnnyswim that feels it should be used in the Olympics called “Diamonds”, and a strong song from Dia Frampton called “Don’t Kick the Chair.” And in a total different tone, Johnny Cash’s “Unchained” album has been on repeat the last couple days! I love the discovery of someone new, and that discovery seems to most often happen to me thru a referral, either from a professional like a music supervisor (like you!) or a producer sending me something really cool, or literally stumbling across an artist on line, whether it’s a video or a sample. Once an artist sparks something in me, I chase the idea of saying “how can I work with them?” or “how can I find a place for their music or that song in my project?” It’s happened on my current movie, as a few years ago I was introduced separately to Johnnyswim, an amazing duo, and to singer/songwriter Dia Frampton. Years passed since that intro to each of them, we’ve all worked on other projects, but now (all going well! ), both Johnnyswim and Dia have songs in my new film. What song in another filmmaker’s movie are you most envious of and why? I’m not sure there’s one particular song I’m most envious of, but I greatly admire the way music is used in some of my favorite filmmakers’ work. “Moulin Rouge!” to this day blows my mind, but Baz Luhrmann has always used music in an incredibly interesting way, since “Strictly Ballroom” and of course in “Romeo & Juliet.” “R&J” may be one of the best soundtracks from the 90s around. Danny Boyle always slays me too, he can do something like “Trainspotting” (another best album from the 90s!) which has such a diverse killer sound, then he can do “Slumdog Millionaire”, which whisks you off to a different world. Both Baz Luhrmann and Danny Boyle are masters at using music for storytelling atmosphere. And Cameron Crowe sets the bar so high with use of music, he can pick an obscure song and you want to go out and buy it immediately, or he can pick an anthem song and have you singing along in the theatre, but be so moved emotionally while you’re doing it that you don’t know what hit you. And I’m not sure anyone is more stylish in their choices than Quentin Tarantino. But if I had to say I’m envious of one song in another filmmaker’s work as of late, I’d say the Wachowskis use of 4 Non Blondes’s “What’s Up” in their show “Sense8” on Netflix. I’ve always loved that song, and when they used it to tie their characters together, my jaw was on the floor! I heard the first few notes and thought “I know that song” but what they did with from a story and character point of view of nothing short of genius and inspiring. It was a simple reminder how powerful the right song at the right time can be used in film. Haha, I’m flattered! I’m honestly not sure there’s anything revolutionary, I like to pride myself, though, on the consistent diversity in my projects, and of music being used as a global language, as a bridge to cross cultural stories. Dance has been coined the “most beautiful form of non verbal communication”, and music is of course the most beautiful aural form of communication. The two together lend themselves to cinema, and speak a true language all their own. A beautiful piece of dance, regardless of the country or world it’s from, can move you; likewise for a beautiful piece of music. I’m lucky I get to do what I do by putting the two together as often as I do. 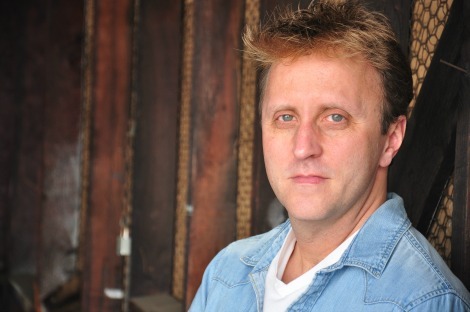 Duane Adler is one of Hollywood’s top writers of edgy, music‐driven dramas. His first directed feature film entitled MAKE YOUR MOVE, which stars DANCING WITH THE STARS sensation Derek Hough and Asian pop star BoA, was released in 2014, and he is in post production on his newest film titled HEARTBEATS, a Hollywood/Bollywood crossover project set in India that wrapped principal photography in February 2016. Duane’s films have grossed over $550 million at the box office and he has written two of the highest grossing teen romances of the past 40 years in SAVE THE LAST DANCE (Paramount) and STEP UP (Touchstone/Summit). A graduate of the University of Maryland, College Park, Duane currently resides in Culver City, California.